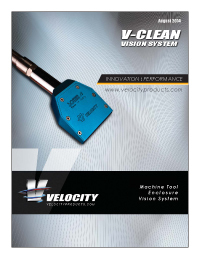 The Velocity V-Clean Vision System clears coolant from machine tool enclosure windows. The V-Clean Vision System is powered solely by shop air and costs significantly less than competing window cleaning devices. The V-Clean Vision System features simple installation via neodymium rare earth magnets. The V-Clean Vision System includes the V-Clean device, an air switch, air hose, and air hose guides. ON SALE - CONTACT VELOCITY! Click here to view the V-Clean Video.